Since my graduation in 2000 I have been a trumpet- and jazz improvisation teacher at the ‘Polderhuis’ in Lansingerland. After many pleasant years the school was forced to close, due to failing subsidy policy. The participants of the jazz combo still go strong. They are now called the Lansing Jazz Combo. 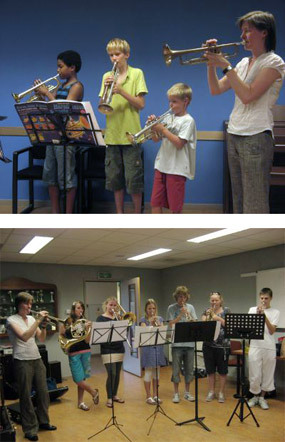 September, 2010 I started teaching trumpet at the Delft University of Technology. Both the team and the enthusiasm of the students are very inspiring to me. Next to that I have a small amount of private students, mostly advanced jazz students looking for creative ways to expand their improvisational skills. In the last years I have been training myself in different ways of teaching jazz improvisation. My goal is to combine listening, understanding, knowing and feeling in small exercises. Whenever I succeed in making an exercise that turns out to be both challenging and fun to both my student and to me, I’m very happy!